Over the last few years, the Middle East had a small share in the global digital advertising expenditure. I made a research to dig deep into the current figures and the stats of 2011 to 2017 to better understand the landscape of the digital advertising in the Middle East including market trends and the status. According to eMarketer report in April 2017, paid media advertising outlays worldwide will increase 7.3% in 2017 to $583.91 billion. Growth will be roughly on par with previous estimates, and spending will rise steadily throughout the forecast period, driven by increased investments in the e-commerce industry and mobile ads. Digital will remain as the fastest growing medium with 14% in 2017. 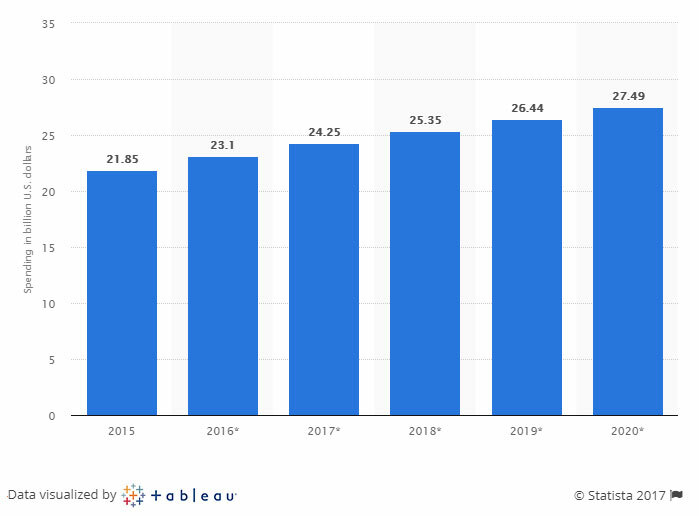 Market size: Worldwide digital ad spending will reach over $205 billion in 2017 and represent 38.3% of total paid media. The numbers are expected to see double-digit growth at least 2020, eMarketer estimates. Mobile ad spending will reach around 63.3% of digital and 24.3% of total media ad spending. Developed economies are expected to show a slowdown in investments in this sector in 2017. Counterwise, ad spend in the APAC market, followed by Latin America are showing a high growth in revenue. Digital vs TV in 2017: Several organizations and researchers also expected a new fact: For the very first time in history, with a projected $205 billion digital ad spending compared to a projected TV ad spend of $192 billion, global digital advertising spend is expected to exceed TV advertising spend in 2017. However the predictions still in process and it might vary from a market to another. Who are the top Players? In 2017, Google and Facebook, the big two in digital advertising are expected to take more than 50% of all revenue worldwide, and more than 60% in the United States, according to research firm eMarketer. Apparently, Baidu is controlling the Chinese market while some local media networks are competing in display market share. In the recent years, experts have predicted that the Middle East and North Africa will show a strong growth in digital advertising. Is that true? We will be looking closely at the top trends in the region to better understand the market share and growth rates. Advertising Spending in The MENA region: According to Statista, a year-on-year timeline presents the total advertising spending in the Middle East and Africa. In 2017, the region is expected to account for 4.1 percent of the global ad spend. 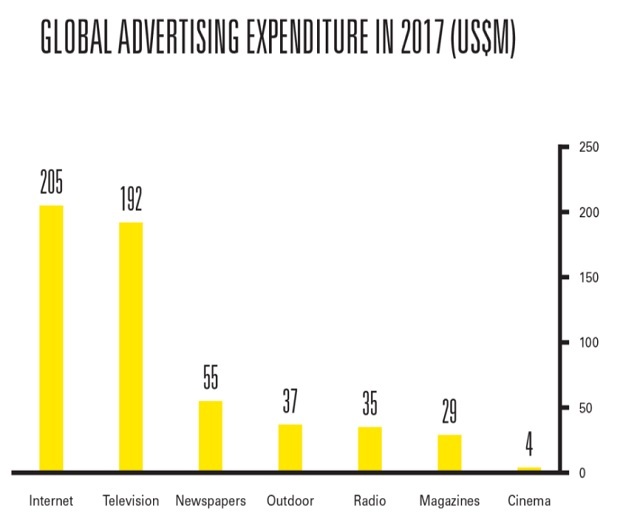 Ad expenditure in the Middle East and Africa would amount to 24.25 billion U.S. dollars in 2017, up from 23.1 billion a year earlier, which would constitute a growth rate of 5%. Growing or decreasing in 2017: However, a recent global ad spending forecast from Zenith had another opinion. According to the source, The MENA (The Middle East and North Africa) will be suffering from the low oil prices. The region forecast expected a decline in ad spend (-9%) in ad spend between 2016 and 2017. Although the Middle East has a small share in the global advertising spend, the region has become a hot spot for international companies. Unlike global markets, TV has the biggest share of Ad spending while only 10% of MENA ad spend is on the digital market according to Istizada, but I believe that the shift towards digital ads is going to catch up in the coming years. GCC countries are expected to grow faster than the other markets like Egypt (which has the biggest share of TV consumers). 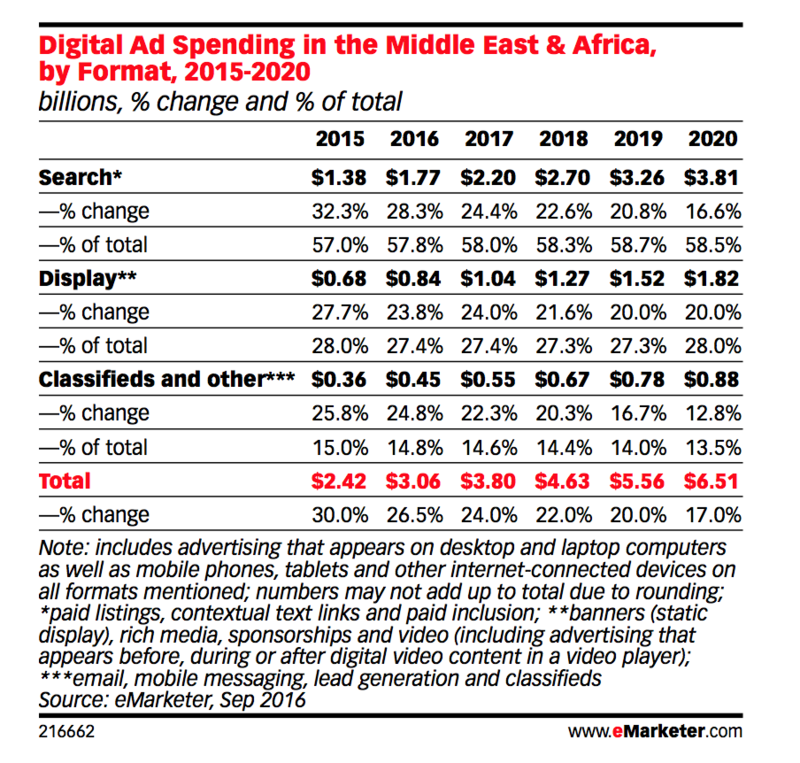 Digital advertising spending the Middle East and North Africa (MENA) is growing in the last three years, but the growth rates are expected to slow down. Currently, estimated at 10% of the total global Ad spend, the Middle East’s spend is expected to reach $3.80 Billion by 2017 (eMarketer report). While forecasting from ArabNet, a group of digital professionals and entrepreneurs, estimated the digital advertising spending in the Middle East and North Africa is as low as $1 billion. *Since there are major differences in the numbers, I believe that the numbers could exceed both if we consider that there are big segments of individuals and small businesses are directly financing Facebook Ads. I have been also working with direct Ad placements on local portals and forums specialized in financial and stocks market. The size of this market is big in the GCC but relevantly unclear when it comes to global statistics. Search advertising comes on top of the list with over 58% of total spending in the region. Google remains the top player in the Middle East and Africa with the huge demand on YoutTube advertising in 2017. According to agencies, YouTube Ads is generating a great increase in digital budgets which is used to be allocated to TV advertising. KSA is leading the region in the numbers of YouTube reach. According to mideastmedia.org, The region has more than 500 digital agencies offering a range of services in the digital marketing, most of which employ less than 15 people. Governments, consumer brands, telecommunication operators, and real estate respectively, are the largest buyers of advertising in MENA. Egypt and the UAE are the most important economic bases for digital agencies and employees. Thanks to the increasing numbers of digital startups, Egypt represents more than half of the advertising agencies and employees in the region, due to its creative talents in content production, translation resources, low salaries, and its main role as a local content creation hub. The UAE represents 30 percent of advertising companies and employees, which benefit from its economic stability and regional headquarters. Majority of the top agencies in UAE are international media and digital firms based in Dubai. Media buying in the region represents a large-scale business, involving bulk advertising, space acquisition, and trading. The media buying unit (MBU) market, therefore, consists of fewer but much larger players who deal predominantly with larger buyers. 70 to 100% of their ad spend is sourced through MBUs. However, like advertising agencies, MBUs are typically owned by international companies. MBUs in the region tend to hold premium advertising spaces across the major platforms (60% share of digital ad spend, 70% of TV, and 50% of newspapers). The stale growth is largely due to the sluggish transition from traditional to digital media ad spend. Unfortunately, with the digital Ad spending still represents only 10 percent of the total advertising market in the region, the investments in programmatic advertising is very low. Collectively, MENA countries trail other regions in innovation and adoption of new advertising and digital marketing technologies (e.g., limited digital measurement, programmatic buying, and non-advertising forms of marketing). The programmatic advertising has been growing through the GCC region in the past years due to the growth of Dubai based digital agencies and Google partners. However, some of the biggest brands in the MENA market are heavily relying on external agencies based in London. According to “Status of Programmatic Trading” survey, skills shortage at 39% and deeper understanding at 33% are still considered the top obstacles for its wider and faster adoption. The region is still lacking behind when it comes to the use of advertising and marketing technologies including machine learning advertising such as Google DoubleClick as well as advanced analytic platforms such as GA 360, Adobe Marketing Cloud and attribution models. As a result, I believe there are many of the opportunities for digital advertising have yet to be realized, despite high levels of digital consumption in the region. There is a big room for digital agencies to tap into the Middle East digital advertising. Let’s take a look at the advertising spend in several of the Middle Eastern countries. United Arab Emirates: The UAE has topped advertising spend in the GCC in the first quarter of 2017. At AED1.5 billion, it accounted for 46% of the total advertising spend in the region for the said period, according to TBWA Worldwide. Meanwhile, digital ad spending in the UAE dropped 14% in January 2017, after rising by 21% for the first 11 months of 2016. Television remains the biggest medium for advertising in the UAE — which accounted for 3.37 billion in revenues in 2015 — and the market is seeing a decrease in some offline mediums and an increase in digital. Turkey: Despite the firewalls and political conflicts in Turkey, digital ad expenditure is expected to grow in 2017. According to IAB Turkey AdEx-TR 2016 Report, the digital ad spend in Turkey reached TRY 1,872.4 Million with a growth rate of 13.7%. The display ad spend grew by 11% and reached to TRY 1,059 million. In Display Ad Category, while video ad spend rises by 34% to TRY 179 million. Search Engine Ad Investments reached to 706.6 million TL. Out of 1,872 million TL of total digital ad spend, TRY 30% was invested in mobile platforms, and 64% of social media ads. In 2016, programmatic trading proceeded to grow and reached to 993 million TL. Iran: Digital ad spending in Iran is estimated to be worth $53 million (without including social media networks), according to Adro. Though experts believe that there’s a big potential in this market due to the increasing numbers of online users and the enhancements in local ad networks. Due to financial sanctions imposed on Iran, social media advertising and Google search are not active in Iran. Only Telegram which is a messaging app/social media is accounted for almost $23.3 million in revenue in Iran. While TV advertising is still leading traditional advertising to dominate the biggest share of advertising in the region, digital ad spending market will continue to grow in 2017 with a huge opportunity to catch-up with global market rates in the coming years. The region cannot resist the global change in advertising. Clients have started demanding payment by results (ROI & Return on ad spend ROAS) as well as enhanced consumer insights and analytics. Even from creative agencies, as well as media buyers. This means the whole industry will shift into digital and sophisticated programmatic advertising which is more accountable. YouTube Ads is one of the hottest trends in GCC region which is going to attract a big share of TV commercial spending in the coming years. UAE is still leading the digital advertising in the MENA region. The majority of international and local brands based in Dubai are heavily spending on digital. However, the agencies are outsourcing a big chunk of technical and creative work to Egypt, Lebanese and Jordanian startups. Sadly, there is still a huge gap in digital advertising efficiency in the region due to the lack of advanced tracking, programmatic technology, and skills. Some of the top brands are still relying on UK’s agencies when it comes to search engine marketing. However, there are very advanced local agencies that need to invest more in building solid capabilities in digital advertising technology. Let’s wait until the end of the year to have the final numbers and keep evaluating the industry. Do you have any experience in digital advertising in any of the Middle East and Africa region? What opportunities do you see lying in this sector?